First stop is Friday night at The Gas Lamp in DesMoines IA. Playing with The Real Action and Josh Davis (of Bright Giant) Show at 8pm, $5 advance, $7 day of show. 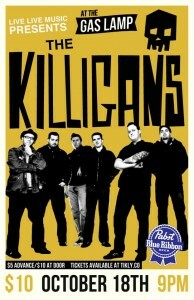 Next we head to Chicago to meet up with our old buddies FlatFoot56. 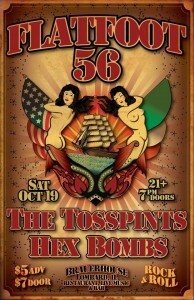 Also appearing are the Tosspints, and Hex Bombs. This show is at the Brauer House in Lombard (1000 N Rohlwing Road #13, Lombard, IL 60148) Dont worry, just because we aint on the poster doesnt mean we arent playing…we will be there! Looking forward to finally hitting the road again!